This stepper is designed to help you meet your individual fitness goals without putting extreme pressure on your bones and joints. The twist action of the stepper will help tone your whole body, specifically working your thighs and buttocks. 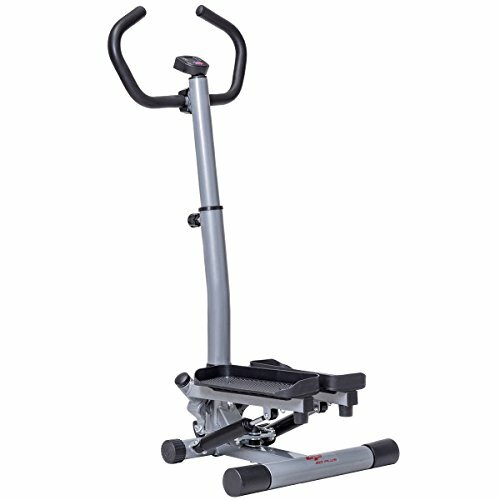 This stepper has handle bars to help keep you balanced while you step. Great for beginners who are new to the stepping world. It includes a multi-function LCD moniter that provides your elapsed time, calories burned, numbers of steps time. With a convenient scan mode, you can choose to have these features continuously repeated to keep up with all calculations .You will be able to see your results to keep you motivated and on pace. The machine accommodates users of different heights with adjustable stepping height. This is a great piece of equipment to add to your home gym or to get you started on your journey to better health.